Inder Loves Folk Art: Kelly Skirt. 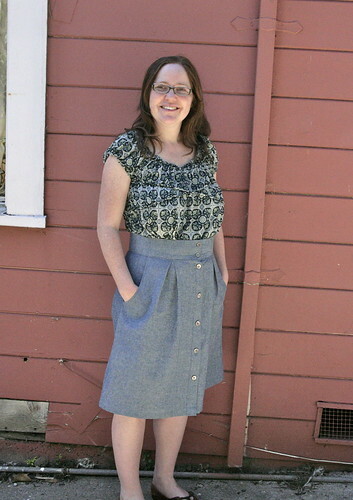 I sewed up several of Megan Nielsen's maternity patterns when I was pregnant. Her patterns are easy, intuitive, and fast - nicely finished but without too many fussy details. The packaging is lovely, the instructions straight-forward and easy, and the patterns themselves are printed on nice, heavy paper. So I was excited to try out some of her non-maternity patterns. 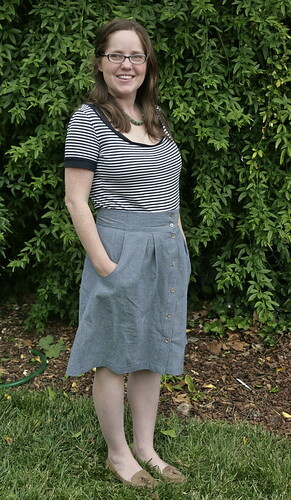 This is Megan Nielsen's Kelly Skirt, a cute, high-waisted button-down skirt with generous pockets. I decided to sew it up in chambray to expand my options for casual Fridays - in the summertime, I don't always want to wear jeans on Fridays. The gray mother-of-pearl buttons give the skirt a bit of polish. Here it is, right after I finished sewing on the buttons, nicely pressed. Sewing up this pattern was not without its hiccups. When I sewed the skirt up the first time, it was one size too small! I had made the cardinal sewing error of going with my RTW size, rather than my actual measurements. This was me when I realized my error: "Waaaaaaaaah!!!!" What a discouraging (and annoyingly dumb) mistake! I admit, I almost put the project aside entirely after that. But after a good night's sleep, I determined that I would not be defeated. I ripped the waistband off, cut a larger waistband, and put it back together, adjusting the pleats slightly to fit. This time, I used my actual measurements and calculated exactly how long I needed the waistband to be. And the fit was perfect. The only other adjustment I made to the pattern was to lengthen it by three inches. As drafted, this skirt is fairly short (even on me - I am only 5'4"). I prefer my skirts to hit around the knee (especially if I'm going to be wearing them to work with bare legs), so I knew it was going to need some extra length. And here it is again, after being worn two days in a row, a little rumply and looking a lot more like how it normally will. Based my experience making this skirt, I have only one piece of constructive criticism: I think the sizing runs a bit small, in comparison to RTW clothing. Don't make the same mistake I did and assume that because you are usually a "medium" that your Kelly Skirt will be too! Definitely pay attention to those finished garment measurements, because they are spot-on. That's not really the criticism, though. I mean, checking your measurements should be Garment Sewing 101. That was a massive fail on my part. The bummer, in my mind, is that the small sizing potentially makes this pattern inaccessible to women of larger sizes (I consider myself pretty average, but I measure a size L in this pattern, which only goes up to XL). And that's a shame, because this is a really cute cut that is flattering on women of all different shapes and sizes. I'm not advocating vanity sizing, but I hope future patterns will have a wider size range. That said, if you're on the edge of the sizing for this skirt, it would be really easy to just lengthen the waistband a bit (like I did) and reduce the pleating a little. I recommend doing this before you've sewn the whole thing together, of course. I had no idea chambray was so hard to pick seams from! I almost went blind trying to see the blue thread and every little mistake shows. But I'm glad I spent the time "making this work," because I love my new skirt. There will definitely be an autumn version in corduroy, and this time I will measure before I sew. you look awesome! well done! Looks great on you! Yup, I can imagine you'd want a few versions in your closet. I keep eyeing this one off, looks like a good basic without but with interesting details. And good on you for being so unstoppable! Oh it's so cute! And pockets make everything better! Way to stick with it, the results are fab! Love it - great fabric choice. It's gorgeous - and I think I like it even better when it has the lived-in look :) I bet it would go with pretty much anything, too. I need more basics like that. Thank you everyone! It is a very "basic" piece, but hey, basics are awesome. It's always fun to sew up something that is pretty easy (minus being a goober about sizing), but you know you will wear a lot. Next up: A not quite so basic Briar top!